Darth Vader prepares for his final battle! Based on his appearance in Star Wars: Episode VI - Return of the Jedi. ArtFX statue features interchangeable arm parts and head pieces. Display the Dark Lord in a variety of poses and looks! More powerful in the Force than ever before, Darth Vader prepares for his final battle as the Rebel fleet hammers the fully operational Death Star in this Star Wars Darth Vader Return of the Jedi ArtFX Statue. 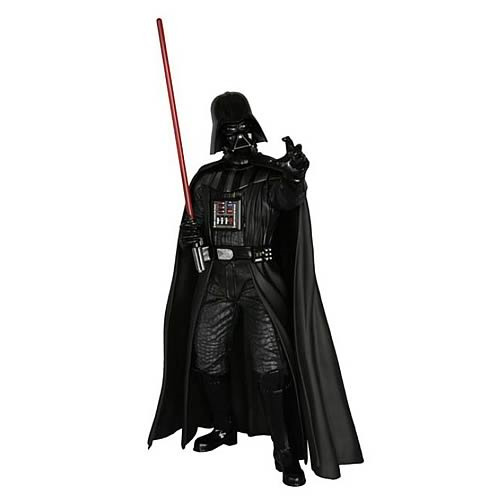 Updated to match his appearance in Star Wars: Episode VI - Return of the Jedi, the Dark Lord stands 7 1/2-inches tall at 1:10 scale, with his crimson lightsaber at the ready for both attack and defense. The fallen Jedi's armor is intricately detailed and sculpted perfectly to match its appearance in the film, with all of the mechanical and cloth elements distinctly textured. With multiple interchangeable arm parts and head pieces featuring the iconic helmet or the unmasked Anakin Skywalker, you can even display Vader in a variety of poses and looks! Like all Star Wars ArtFX statues, the Darth Vader Return of the Jedi ArtFX Statue has magnets in his feet for display on the included base. Ages 15 and up.